Who is Christian and what is authentic Christianity in an age of counterfeit faiths? That is the subject of Carmen’s conversation with Dr. Albert Mohler, President of The Southern Baptist Theological Seminary. Dr. Mohler hosts two programs: “The Briefing,” a daily analysis of news and events from a Christian worldview; and “Thinking in Public,” a series of conversations with the day’s leading thinkers. He writes a popular blog and a regular commentary on moral, cultural and theological issues. Carmen LaBerge: Friends, what do you believe, and what do you rely on in terms of your confidence of a confessional faith, as an authentic Christian living in the context of a really confused culture and world? One of the ways I sort all of that out is by listening every day to The Briefing by Dr. Albert Mohler, of the Southern Baptist Theological Seminary in Louisville Kentucky. Carmen LaBerge: We have him here this morning with us to discuss his newest book, The Apostle’s Creed. And Dr. Mohler, first of all, welcome to Mornings With Carmen, and thank you for being with us today. Albert Mohler: Carmen, always great to be with you, thank you. Carmen LaBerge: So I want to start with this question, are you trying to catechize Southern Baptists? ‘Cause I have sniffed out that this is the third book in what might be a series. The first one was on the Ten Commandments, I feel like that came out a number of years ago, Words From The Fire. And then you did one very recently on the Lord’s Prayer, The Prayer that Turns the World Upside Down. And now we’ve got, The Apostle’s Creed, Discovering Authentic Christianity in the Age of Counterfeits. Are you trying to catechize Southern Baptists? Albert Mohler: Well I certainly am Carmen. And I’d be glad to catechize others than Southern Baptists as well, other believers. But you will recognize there are those three legs of a tripod of historic Christian teaching, with the Lord’s Prayer, and the Ten Commandments, and the Apostle’s Creed. So this is my intentional third volume in that series. And I appreciate you noticing that. Carmen LaBerge: Absolutely, well I am a student of yours. If someone can cobble together a transcript by listening to you teach in your various in sundry incarnations of what you do around and about, I have quite a Mohler emerging. So I really appreciate this Apostle’s Creed book. Carmen LaBerge: Let me start with this, we’re talking about the faith once delivered. Not just anything or any set of ideas that I might cobble together or syncretize that meets my needs in the modern day. Talk with us about the value of the faith once delivered. ‘Cause I feel like that’s sort of the why behind this Apostle’s Creed book. Albert Mohler: Well it really is. You know, there are people who think that Christianity is kind of a bucket of doctrines and different people have different doctrines. But you have the New Testament reveals a faith delivered intact and whole. And that’s especially what the Apostle’s Creed tries to articulate, to confess, to protect, to teach. Albert Mohler: And so I want to believe the very same Christianity taught by the Apostles, given by Christ to the Apostles. And by the Apostles given to us. And especially not counterfeits. There’s so many false Christianities out there. So that’s a big big reason behind the writing of this book. Carmen LaBerge: So when we talk about Christian doctrine, I think that there are probably folks who kind of glaze over. But this is really a book that is designed to put the Apostle’s Creed, not only my head, and not only my heart, but in my footsteps. Like this is a walking out of the faith, into the realities of the world. Talk about that connection. Albert Mohler: Well Christianity is a faith to be lived, a faith to be breathed, a faith to be obeyed, a faith to take us into every dimension of life. And you know, when people think of, if they think of the Apostle’s Creed, they might think of it just as a statement of facts, which of course it is. Albert Mohler: But you know, it takes the shape of narrative. It takes the shape of telling the story of Jesus, and beginning with God the Father. It’s an amazingly concise way of understanding quickly what authentic Christianity is. Just like, to mention the others, the Ten Commandments are the summary of the entire law. The Lord’s Prayer, it takes just 20 minutes to read it, but that’s how Jesus taught his disciples to pray. And the Apostle’s Creed is this short summary of the Christian faith, telling us what essential Christianity is and to know that Christians have been, have purists and have been taught by this creed for so many centuries is an incredible encouragement to me. Carmen LaBerge: So when we, I want you to unpack one of these phrases. But in order to do that I think we’re gonna have to devote a considerable number of minutes, so I wanna do that after the break. But before we go into the break, Dr. Mohler, I would appreciate if you would just share with people who are listening, when you meditate on the Scriptures, when you meditate on the Lord’s Prayer, when you meditate on the Ten Commandments, when you meditate on the Apostle’s Creed, what does that look like? Albert Mohler: Well long ago I memorized them. And that was very important to me, so that I don’t have to think about them, as in trying to remember word by word, or worrying if I’ve got a phrase missing somewhere. All three are so concise they’re quite easily memorized. Albert Mohler: And then when I think of them, I think of them phrase by phrase. And I think they’re meant to be understood that way. The Lord’s Prayer is a prayer that is phrase by phrase, “Our Father who art in heaven, hallowed be thy name.” Or the Ten Commandments, “I am the Lord your God, you shall have no other gods before me.” Or the Apostle’s Creed, “I believe in God the Father Almighty, maker of Heaven and Earth.” Those are statements. They are phrases. And they’re truth claims. Albert Mohler: And strength comes into my life spiritually just meditating upon every one of those phrases. This is exactly who we believe in. This is the one true God. The God who is Maker of Heaven and Earth. Carmen LaBerge: So I so appreciate that. If you are interested in a copy of this book, which now they’re just gonna totally blow up my text line, but that’s okay. So the book is The Apostle’s Creed, Discovering Authentic Christianity in an Age of Counterfeits. It literally just became available today. So you haven’t had it in your hands yet. And if you would like to enter a drawing for one of the copies that we have in studio, we’re giving them away. You can text me your name and address 877-933-2484, you can email that same information at carmen@myfaithradio.com. Carmen LaBerge: I’ll be back in just a minute with Dr. Albert Mohler, and he is gonna unpack for us one phrase of the Apostle’s Creed. And I’m gonna specifically ask him to unpack the phrase about Easter, which is quickly approaching. You’re listening to Mornings With Carmen, I’m Carmen LaBerge. Albert Mohler: Well that’s right. That’s essential Christianity. The Apostle’s Creed is only a few dozen words, that’s it. And so if you have to express true Christianity, what every Christian must know and believe, in just a short economy of words, then you can only put in the most essential truths. And the center of the entire creed is about Jesus Christ, and that is indeed the entire image of the Apostle’s Creed, is right in the middle. Albert Mohler: “The third day he arose again from the dead.” The declaration of his bodily, physical resurrection from the dead as the vindication of his atoning work on the cross. It is the great hinge of history. It’s the great hinge of the Apostle’s Creed. There is no Christianity without the bodily resurrection of the Lord Jesus Christ. Albert Mohler: And if the Lord is raised from the dead, as the Bible says, then everything is changed. And so arguably, that very phrase is the central hinge phrase of the entire creed. Carmen LaBerge: So how do we respond today when people who consider themselves to be Christians, but who don’t believe what you just described as necessary for essential Christianity? And they would say, “Well the Apostle’s Creed is an ancient statement. It’s a part of our theological heritage, it’s no longer relevant.” How would you have us respond to folks like that? 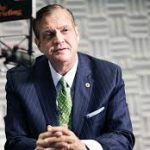 Albert Mohler: Well you know, I like the way you began the question Carmen, when you said, “What about people who believe themselves to be Christians?” Or, “Consider themselves to be Christians, but who don’t believe essential Christianity?” Well the Bible says they’re not Christians. They may be affiliated with some kind of Christianity or some church somewhere, but if they don’t believe the truths about Christ, they’re not Christians. 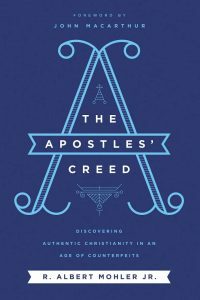 Albert Mohler: And that’s not on my authority, that’s not even on the authority of the Apostle’s Creed. Now here’s what the Apostle’s and what the church was trying to say in the creed, that this is necessary. But just consider the Apostle Paul. In Romans chapter 10 verse 9, when he tells that a Christian is one who confesses with our lips that Jesus Christ is Lord and believes in our heart that God has raised him from the dead. Albert Mohler: And Paul makes the defense of the bodily resurrection of Christ in First Corinthians 15 crystal clear. So it’s not just me, certainly. It’s not even just the Apostle’s Creed. It’s the New Testament that says that there is no Christianity, there is no Christian, where isn’t belief in the bodily resurrection of the Lord Jesus Christ from the dead. Carmen LaBerge: So, Dr. Mohler, you and I both know that every single day, we are confronted with cultural realities that present themselves as ways in which people might operate in the world in sort of a pseudo-Christian way. How does the Apostle’s Creed and along with it the Ten Commandments and the Lord’s Prayer, how do these strengthen us, not only in our orthodoxy, but in our orthopraxy, in how we actually live out the faith, not only as individuals but corporately as the body of Christ in a world today? Albert Mohler: Well that’s another very good question. And you know, one of the venerable phrases of the church, is that, “As we believe, so we pray.” And that’s just really important. 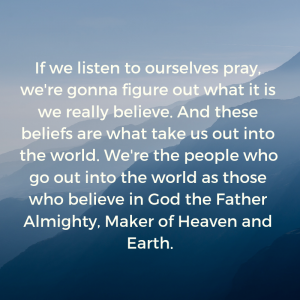 “As we believe, so we pray.” Our beliefs show up in our prayers. Albert Mohler: If we listen to ourselves pray, we’re gonna figure out what it is we really believe. And these beliefs are what take us out into the world. We’re the people who go out into the world as those who believe in God the Father Almighty, Maker of Heaven and Earth. That means our internal worldview begins with the understanding that there is a creator God who has made the universe. The universe is not purposeless. It has meaning, it’s not directionless. It has direction under his sovereignty. And we’re the people who believe in the brokenness of the world, but we believe in the fact that the Father gave Jesus Christ his Son. And we believe all the truths about Jesus, his death, burial and resurrection. We believe it all. And even as we confess within the creed. Albert Mohler: When we go into the world we need to understand what is right and wrong. And we walk into the world armed with the Ten Commandments as the very structure of God’s law. And we can’t imagine what it would be to try to negotiate to live, operate in this world without it. Albert Mohler: And then we are driven to prayer. And the Lord’s Prayer is not some kind of mood prayer. It’s again, a prayer based in truth, in which Jesus taught his disciples how to pray. And many times during the day, true Christians are driven either on our knees, or just however our posture to pray, “Our Father who is in Heaven, hallowed be your name.” We need these structures for the Christian faith. Without them Christianity just becomes kind of a mood. What some contemporary people would just call a spirituality. 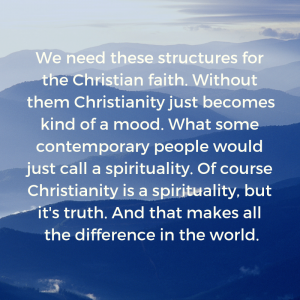 Of course Christianity is a spirituality, but it’s truth. And that makes all the difference in the world. Carmen LaBerge: Well and one of the things I greatly appreciate about the way you approach The Briefing, the way you approach Thinking in Public, obviously the commentaries that you post at albertmohler.com, and your leadership of Southern Seminary, I appreciate that you’re not selling Christianity as like a slice of the pie. You’re not allowing me to believe a delusion about Christianity being like an add-on to the rest of my life, that it’s the spiritual add-in to whatever else I’ve got going on. You really help us understand how Christianity is, if it’s authentic, it is the operating system of my life. Carmen LaBerge: You used some language related to that, that has the word whole in it, but it’s not springing to my mind right now. But I’m sure it’s springing to your mind. That Christianity is, and you used the word whole when you describe it. Albert Mohler: Right, Christianity is a whole truth claim, which applies to all of life, all the time. It is a whole, W-H-O-L-E. It’s not just a bunch of pieces. It claims my whole life, and that gives me great comfort Carmen. And I very much appreciate the way you express your own confidence in the reality of the Christian faith. That’s what we want listeners to hear. We want them to know Christ, we want them to know true Christianity. Albert Mohler: And true Christianity’s not just a mind game. It’s the Gospel of Jesus Christ, by which we’re saved. A gospel that sends us into the world. And the world’s filled with counterfeits, as the subtitle of my new book indicates, we’ve got to have some structural guides to help us to distinguish between the counterfeits and true Christianity. We want the true Christianity. Carmen LaBerge: Absolutely. So the new book is The Apostle’s Creed, Discovering Authentic Christianity in an Age of Counterfeits. I’ve got a couple of copies. You can text your name and address to 877-933-2484, or you could email me carmen@myfaithradio.com. I highly recommend getting all three books, The Apostle’s Creed, Discovering Authentic Christianity in an Age of Counterfeits, along with The Prayer that Turns the World Upside Down, which is about the Lord’s Prayer, as a manifesto for revolution, and then Words from the Fire, which is, Hearing the Voice of God in the Ten Commandments. Carmen LaBerge: If you’re looking for, not just Dr. Mohler’s view of what I would call a systematic, operational theology to walk your faith out into the realities of the real world. But if you’re looking for something that is actually easily accessible, like this is written by a seminary president, but it’s written at a lay level. And so, Dr. Mohler, again thank you so much for what you do every single day. I feast on The Briefing, so thank you for getting up everyday and doing that first thing. Thank you for Thinking in Public. Carmen LaBerge: Folks you can find Dr. Mohler at albertmohler.com. If you follow him on Twitter, you will find out he’s a really really proud grandpa. Thank you so much sir. Albert Mohler: Carmen, thank you so much, great to be with you.